Atheseus R. Lockhart was born in Los Angeles, CA. Mr. Lockhart served in the United States Navy for 13 years as a personnel administrator. While in the Navy, Mr. Lockhart received numerous awards and accolades for his performance and was involved in Operation Just Cause in the Panama Canal, Operation Joint Endeavor in Bosnia-Herzegovina and Operation Continue Hope in Somalia. Mr. Lockhart attended Columbia College where he attained a Bachelor of Science degree in Business Administration with a dual emphasis in Management and Financial Services in 2000. Upon the expiration of his enlistment, Mr. Lockhart attended Florida State University College of Law where he received his Juris Doctorate in May of 2003. During law school, Mr. Lockhart interned with the Office of the Attorney General and the Children’s Advocacy Center at the College of Law. 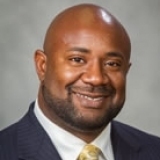 Mr. Lockhart also gained valuable experience as a leading law clerk at the Department of Business and Professional Regulation, Division of Alcoholic Beverages and Tobacco for two years. Upon graduation from law school, Mr. Lockhart was provided the opportunity to serve as an Assistant State Attorney for the Ninth Judicial Circuit in Osceola County as a felony prosecutor. After gaining valuable trial experience, Mr. Lockhart transitioned to civil litigation. Mr. Lockhart has had the honor of defending a wide variety of corporations and businesses in cases involving commercial litigation, personal injury, premises liability and insurance defense issues to include No Fault Benefits (PIP), bad faith, errors and omissions and uninsured motorist coverage. His current practice includes the defense of general and subcontractors in construction defect claims throughout the State of Florida as well as defending clients in bodily injury, premises liability, wrongful death and other general civil liability claims. Mr. Lockhart is an AV rated attorney, member of the Orange County Bar Association, National Bar, Florida Bar and actively participates in the Orange County Teen Court program. In addition to the practice of law, Mr. Lockhart enjoys reading, sports and spending time with his family.